X Per is an X-ray binary where material from a Be star disc accretes onto a companion neutron star. It is Vmag 6.7 so bright enough for high resolution spectra. I’d like to (re)start a monitoring programme on the Be star X Persei, the optical counterpart to the X-ray pulsar system 4U0352+309. This is an unusual X-ray system, with a slow pulsar (~14 mins spin period) in a wide binary (~250 day) orbit, which exhibits phases where the Be star loses it’s circumstellar disc (characterised by unusally faint periods where the primary fades to V~6.9-7.0). X Per is generally a bright B0e star (V~6.4-6.7), and I’m interested in setting up a long term monitoring project to try and follow the system through it’s next disc-loss phase. I did this in the 1990s (as part of my PhD) and it was very successful, and with the growth of amateur spectroscopy I’m keen to see if we can keep tabs on the behaviour of the H alpha line as well as on the photometric behaviour, as this line is a strong indicator of the state of the circumstellar disc that gives the Be star it’s “e”. In BeXRB systems (and X Per in particular) the H alpha emission and IR excess are exactly as would be expected from a standard Be star, and the neutron star accretes from passage through the outer regions of the disc (leading to transient emission), so a system like X Per can be considered and monitored in exactly the same way as a single Be star. Changes in the disc have an impact on the X-ray behaviour of the system, as the neutron star is influenced by changes in the size and density of the disc (which is where it occasionally accretes, once the disc reaches the distances of the neutron star orbit). So monitoring the disc emission provides a clue as to the future behaviour of the X- ray source, and I’m hoping that a monitoring programme can help predict X-ray emission when we start to see signs of disc growth and then loss. Ideally I’m looking for as much UBVRI photometry as possible over the next few years, with any H alpha spectroscopy an added bonus. The system has long period variability, but short period (minutes) changes in both photometry and spectroscopy have been noted previously. I’m going to be setting up a monitoring programme using the Faulkes Telescope Project (via the Las Cumbres Observatory facilities, mainly the 0.4m ‘scopes in the network as this is a bit bright for a 2m! ), but having additional data would be fantastic and would be really valuable in helping to monitor the overall system on timescales of weeks-months-years, and correlate with X-ray behaviour in particular. H alpha line profile and the overall spectral shape, and/or just the EW of H alpha, would be useful - H alpha (as high res as possible) is really what I’m after at this point as it’s usually the best indicator of disc behaviour, but any data that can be gathered would be great. I’m hoping to get a Masters student to look into all of this over the next year, and then each year after that, as it seems to be an unusual system even amongst the Be stars, and also amongst the BE/X-ray systems! I also sent on to Paul Roche - hope that's OK. Yes, that's great. Thanks ! 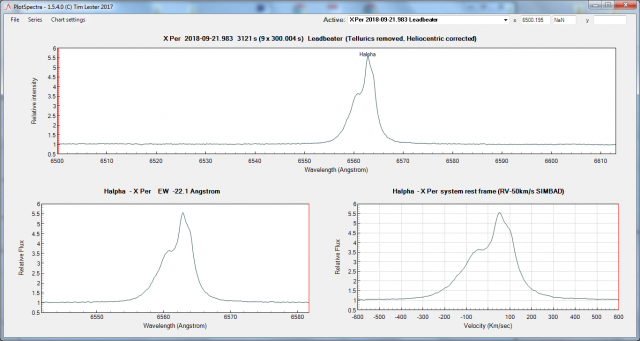 I think monitoring with low resolution spectra will be useful to detect any significant changes in the strength of the emission lines and when combined with the photometry, will give an absolute measure of the flux which is difficult to do at high resolution. Thanks for querying the response correction. There was indeed a very shallow dip in my response correction curve around 5000Å. So I revisited my response correction by applying the continuum response shaper in BASS from a more 'distant' perspective. I would normally smooth the response correction curve by zooming in on 2 sections, from 3600-5500Å and then continuing on to 5500-7700Å. In this second attempt I smoothed the curve in one view from 3600-7700Å. The shallow dip around 5000Å was much less visible in this revisited curve, although there is still an 'undulation' in the resulting X Per response corrected spectrum, so it would be interesting to compare with another low res spectrum on the BAA database if one appears. I always review the response corrected reference star spectrum against the library reference for obvious discrepancies but I should have questioned more the bump around the HeI emission. I have replaced my spectrum in the database with this newer v2. Response correction of low res spectra can be a bit of an art form, especially at the near UV end where it can be like grasping the tail of a thrashing snake! If the flat has done its job well the instrument response should be nice and smooth (just the flat lamp spectrum and atmospheric extinction plus any wavelength selective sampling at the slit due to chromatism) I am not sure if BASS does this but ISIS even assumes a black body curve for the flat lamp so in theory with ISIS ideally all you should be left with is the atmospheric extinction. With my LHIRES at H alpha high resolution this results in a dead flat instrument response within a couple of percent every time so it is hardly worthwhile doing an instrument response correction. In practise with my ALPY there are some small ripples at a couple of percent from the sensor response which the flat has not quite dealt with and a rather nasty kink to deal with around 4000A. I am not sure where it comes from but others have also reported it. Perhaps the reflectivity of the paint used on the reflector used in the ALPY calibration module ? Note the variation in shape in this collection of my IR curves. A lot of this I believe is due to chromatic aberration in my focal reducer coupled with slight differences in focus. I now have four observations and thought I detected some regular, cyclic activity. I made a gif in ISIS to try and draw this out..
You could well be right. I was looking at the variability the other day, using some from the BAA database and some I had been sent direct. The spectra are good quality and there is good coverage so it might be possible to characterise the variability. There is some sign of rapid variations, even from day to day though so any period might be rather short. It might be worthwhile doing a run over a full night and looking at the short term variability. Similar variability is also seen in the He 6680A line. Quick low res comparison processed in ISIS. Here is one from the 18th November with an Alpy. What changes are we looking for, and how often should we monitor with low resolution spectra? As I understand it from Paul Roche's comments this is a long term project (with a timescale of years), primarily to alert when there has been a change in the disc state, indicated by changes in the H alpha line so similar to typical Be star monitoring. Though this would likely change if something significant is seen. High resolution H alpha spectra will probably show more subtle changes first but a low resolution spectrum would also pick up significant changes in emission line strength so I would suggest an occasional look say once every few weeks or so, particularly if you see in the BAA database (where most of the campaign spectra are being stored) that there has been a significant gap since the last observation.